Olivia got up early to finish making the homemade marshmallows that we started making on February 13th. 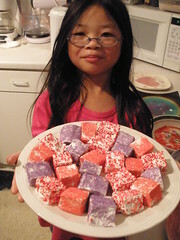 She rolled each marshmallow in sprinkles – red, purple, white, and pink. I rolled some in powdered sugar. It was an interesting process making homemade marshmallows. It takes a while to make them (it was a 2-day process for Olivia and me), but the end result was worth it. The homemade marshmallows have a different texture than the packaged ones, and do not melt when you put them in hot chocolate. I’m curious to see what they would taste like toasted over a fire and used in smores. Ingredients being mixed for 15 minutes.